After a month filled with sadness and anger over the attack in Orlando, the LGBTQ community and their allies took to the streets to celebrate Pride parades across the country, in New York, San Francisco, and Chicago. Many Celebrities celebrated Pride, too, posting their support on social media and marching in solidarity with the LGBTQ community in the parades. While Pride is always a big deal, this year's is special for a few reasons. There's the fact that the 2016 event comes in the tragic wake of the Orlando shooting, in which 49 attendees of a gay nightclub were killed, but on a happier note, it also marks the one year anniversary of the Supreme Court's decision to legalize gay marriage. The Orlando shooting may have led to increased security at pride events, but it did not deter many of those wishing to celebrate LGBTQ pride. In addition to the usual costumes, dancing, and frivolity, 2016 Pride events have paid tribute to Orlando in their own ways. While it would be understandable for anyone to be wary of attending a Pride event for safety reasons, the visual display of solidarity in the parades' massive turnouts is powerful. It's also uplifting to see all the below celebrities publicly support the LGBTQ by appearing at and posting in support of Pride celebrations. Here are some of the many stars who celebrated Pride this Sunday. The Jessica Jones star expressed her desire to be at Pride with this adorable Instagram post. The NBA player showed his support for the NBA and WNBA's historic float in NYC Pride. The One Tree Hill star attended NYC Pride with her friends. The musical sisters sent out a loving Pride message to fans on Twitter. 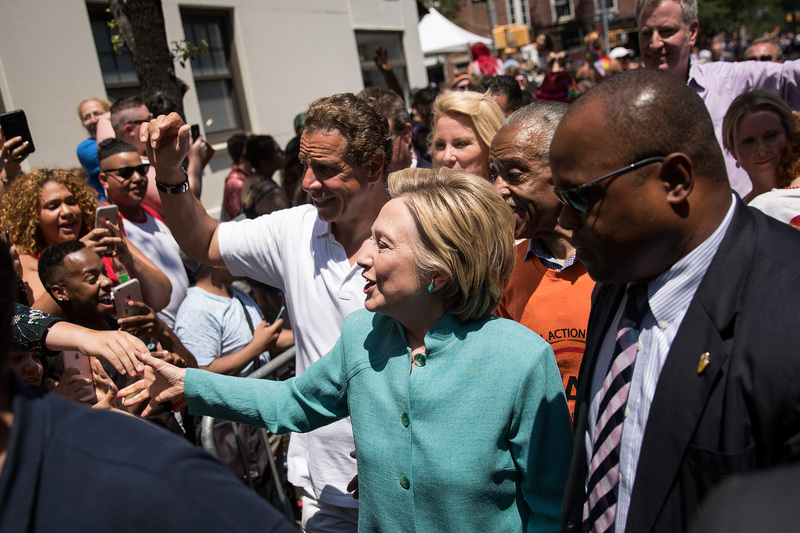 The presumptive Democratic nominee joined in the parade in New York City to show her support of the LGBTQ community. The 14-year-old actor reposted some Pride-appropriate graffiti. The comedian dressed sharply for NYC Pride. The cast of the Netflix show had their own float and took the best selfies. The Apple CEO marched in San Francisco on Sunday. The comedian tweeted a photo of her cousin, Senator Chuck Schumer, marching at Pride. The Modern Family actor knew exactly what to wear to NYC Pride. The soulful singer attended London Pride on Saturday. The designer and Project Runway alum posted this picture advertising these Pride shirts, the proceeds for which go to the OneOrlando fund. The Marina and the Diamonds frontwoman posted this video from NYC Pride. The SNL veteran sent out this thoughtful message in honor of Pride. The Glee star posted in support of Pride (he attended last year). Pride festivities are still going on in many cities, so it's not too late to join in and show your solidarity, and maybe spot a celebrity or two in the process.